Having confirmed that his business title really is ‘The Laser Guy’ Bill begins, “today I’m going to explain ‘why’ Barco laser.” Mentions the press release yesterday with the milestone of 50,000 Barco screens and Barco also market share leader in laser cinema. – First commercial integrated 6P laser projector. Also award winner – Lumiere 3D AIS Award and BIRTV 2014 Grand prize. Inside it is 6 Primary Laer3D sets – two each of red, green and blue. Bright, smooth and beatiful colour picture. Works with silver, matt, screen and active or passive 3D glasses. “Clean & Green” is the motto. Over 30,000 hours lifetime it provides 54,000 AVG lumens. Lifetime saving of 150,000 KwH savings over lifetime. Improve audience experience – Improve exhibitor profitability. Dovetails with Escape, AE, Cinema Barco. Commerciallly availlable and delivering globally. Installations in China, Europe and the Americas. 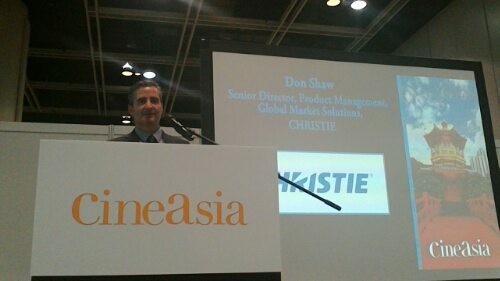 He thanks ICTA for the opportunity to present. First a quick introduction to NEC Display Solutions. NEC’s laser strategy is both RGB laser projector and laser phosphor projector. Firstly focus on laser phosphor ads affordable and compact projector. Then focus on RGB laser projector. NEC phosphor projector first. “World’s first DCI-compliant laser light source projector,” Takeshi claims. Fully integrated laser light source projector. Compliant with 3R laser regulation. His slide shows laser phosphor mechanism whereby blue laser lights and yellow phosphor light goes through lens and prism to create red, green and blue light. Lots of experimanting with higher efficient phosphor material led to the development of the projector. Stresses compact and low maintenance. No exhaust or chiller needed because of less heat. Reliability and redundancy. 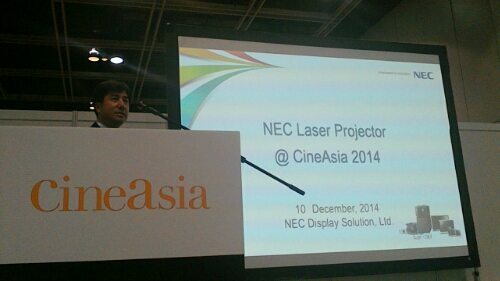 “Laser phosphor projector is best solution for exhibitors looking for economy laser cinema solution,” he concludes. “As most of you know, we have a 6P laser projector here and we are running demos throughout the week. We have discovered key driver is 3D, so laser for a premium 3D experience.